Though it may be difficult to perceive, landscapes are constantly changing form and position. High-precision GNSS is one of a handful of techniques capable of quantifying these changes and is a key component of many modern geologic, biologic, and engineering studies. 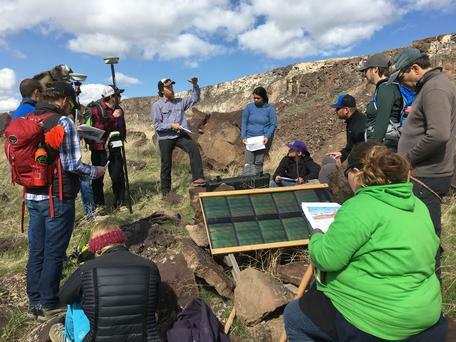 In this unit, students will learn how to approach a study in change detection in the context of a geomorphic or structural problem, then design and implement a GNSS survey that effectively explores the problem. Through field-based application of kinematic GNSS techniques, students will design, execute, and analyze data from a survey to detect change. Students design the survey based on a question of scientific or societal impetus and are asked to defend their design and implementation. This is the final unit focused on kinematic GNSS and is aimed at solidifying students knowledge and technical skill in this technique. Teaching Idaho State University students how to conduct a GNSS change detection survey at the Salmon Falls Landslide, Idaho. Students can design, conduct, and analyze a GNSS survey of changes in monumented objects. Students can analyze and interpret changes in monumented objects. Students can analyze and interpret changes in both two and three dimensions and know which is appropriate for a given question. Students can apply findings from a kinematic GNSS change-detection survey to an issue important to society. Cognitive: Students are taught how to calculate and interpret three-dimensional change between objects. They are shown how to decide whether change detection is possible in a given setting. Behavioral: Students are directed to use kinematic GNSS techniques (field-based and post-processing) to accurately measure the positions of moving objects. Affective: Students are shown examples of how change detection can be used to assess hazards (e.g. mass movements in transportation corridors) and/ or to study the dynamics of hazard producing processes. This introductory unit is appropriate for upper-division geoscience, earth science, geography, or civil/environmental engineering students who have already been introduced to basic concepts such as plate tectonics, mass movements, and hydrology. Students should also have a first-order familiarity with uncertainty, precision, and accuracy. Appropriate for academic year courses with field components or a summer field camp. This is the last unit of the field-based kinematic GNSS series and assumes completion of Unit 1: GPS/GNSS Fundamentals and Unit 2: Kinematic GPS/GNSS Methods. Unit 2.1: Measuring Topography with Kinematic GPS/GNSS, including instruction on surface interpolation; if your Unit 2.2 project will include surface difference maps, you will want to include some elements of Unit 2.1. Otherwise, instructors can choose to do one or both of the application units: Unit 2.1 and/or Unit 2.2. The unit should require ~6 hours to complete the lecture, design, implementation, processing, and analysis steps. Changes should be greater than 3 cm to be confidently detected. Tracked objects should be numerous and varied rather than singular. Singular objects are best tracked using static GNSS techniques discussed in Unit 3: Static GPS/GNSS Methods. Students will be trained to use these techniques for a variety of change-detection applications in earth sciences, engineering, and geography. Students are introduced to various change-detection applications and shown under which circumstances kinematic GNSS is best applied. Students practice calculating change in a monument's position between two points in time and are asked to consider the continuity of that change over the interval. This unit begins by presenting students with a field area and posing questions to them on how they might apply a kinematic GNSS survey to ask a question of scientific or social importance. Will the measured changes be greater than the uncertainty of the method? Will our traffic in the field site affect the rate of movement? How do we assure that the techniques we use now are similar to those used in the previous survey (method consistency)? Etc. Students will work first individually, then seek a group consensus for the design of a kinematic GNSS survey to detect change. Students work together to implement their survey design in a field environment. Students are in charge of all aspects of the deployment from packing, to setup, surveying, and data collection. Students are asked to keep individual field book entries with appropriate metadata and logs that will be turned in and assessed. Any change in the monumented objects caused by student activity must be noted. After students have implemented their survey, they will post-process it with guidance from Unit 2's methods manual. Students are expected to provide individual analyses of the change detected using a variety of methods. A write-up is then formulated answering posed questions and using their total experience and knowledge on kinematic GNSS system and its appropriateness for the study. Student exercise: students learn the basics of differencing two data of topographic surfaces (or point data) and analyze the precision of the resulting change. Summative assessment: students design and conduct a kinematic survey in order to detect topographic change. This unit requires kinematic GNSS hardware. We suggest one base station for the group and at least one rover per 5 students. All hardware should come from the same manufacturer for ease of instruction and data processing. Always have your hardware fully charged, professionally serviced and recently field tested before handing it over to students. In-class hardware malfunctions are distracting and frustrating. If your school does not have kinematic GNSS equipment, you may be able to find colleagues who do or consider requesting support from UNAVCO, which runs NSF's Geodetic Facility. This unit is intended to be field based and student driven. Students should demonstrate their ability to run a survey with minimal help beyond the guide materials provided. Student will likely need some direction in asking questions relevant to available sites and their characteristics, but the final decision should be made by the students. If revisiting a previous site with repeat observations, ask the students more complex questions as to why the survey is designed the way it is and to justify whether kinematic GNSS is the appropriate method. We have provided some ideas for field sites with preexisting benchmarks or campaign data sets to help you get started with change detection ideas. Students should be aware that GNSS surveys are about precision, which includes detailed notes on metadata about the setup. Students must take personal notes about the equipment, survey design, and its execution to be successful. Students are encouraged to notate when they encounter issues and how they resolve them. An example of a field book setup may be provided to students and is available in the educational resources, but it is only a guide and may be modified or substituted based on instructor preference. The spreadsheet-style format can also be distributed to the students if they do not have field books or if the full-page format is preferred. An example field log is provided, and students are encouraged to fill this out or create their own. Metadata such as equipment type, manufacturer, and important settings should be recorded. Additionally, an equipment log is provided, and this can be used to engage students while they are not taking points. Much of the formative assessment can be done through observations of and discussions with students individually, in pairs, or periodically in the whole group. This should be done periodically throughout the process and helps gauge student understanding and weaknesses. Students should be encouraged to answer their own questions through deductive reasoning. A large portion of the grading should be attributed to students' individual participation and contribution to the group effort. Students will turn in their Unit 2.2 Calculating Change student exercise. Questions should be graded for completeness. The students will turn in their survey design, sketches, and final write-up. The final write-up needs to display the student's cumulative understanding of kinematic GNSS systems, their application, and techniques. A large portion of the grade should focus on the student's understanding of why the specific technique and design they used was appropriate for the questions posed and how kinematic GNSS improved the quality of the study over other methods. J. A. Gili, J. Corominas, and J. Rius, 2000. Using Global Positioning System techniques in landslide monitoring. Engineering geology, 55(3): 167–92. J. P. Malet, O. Maquaire, and E. Calais, 2002. The use of Global Positioning System techniques for the continuous monitoring of landslides: application to the Super-Sauze earthflow (Alpes-de-Haute-Provence, France). Geomorphology, 43(1): 33–54. J. A. Coe, W. L. Ellis, J. W. Godt, W. Z. Savage, J. E. Savage, J. A. Michael, J. D. Kibler, P. S. Powers, D. J. Lidke, and S. Debray, 2003. Seasonal movement of the Slumgullion landslide determined from Global Positioning System surveys and field instrumentation, July 1998–March 2002. Engineering Geology, 68(1): 67–101. M. C. Eckl, R. A. Snay, T. Soler, M. W. Cline, G. L. Mader, 2001. Accuracy of GPS-derived relative positions as a function of inter-station distance and observing-session duration. J Geodesy 75: 633–40.